There’s nothing better than hot, homemade soup to assuage the cold weather. Scale the fish with a knife, remove the innards and fillet, remove the gills, the eyes and wash it. Keep the fillet into the fridge and fry with cooking oil the fish’s head and bones. Leave them on the side. In the same pans fry all the vegetables before cleaned and chopped, add tomato sauce and fry for 15 minutes keeping starning. Reduce the wine to 20% add all the ingredients that you fried before and cover with cold water. Cook for 45 minutes, then rest for 20 minutes out of the stove. Boil the potatoes from cold lightly salty water until well done cooked. Peel the potatoes, crash down with fork or pass them throw a strainer. Add the egg, flour, saffron and mix shortly, forming a unic dought. Helping with a bit more flour make the gnocchi form or a little bowl. After you’ve made gnocchi, cut the fillet in a small pieces. Pass the soup through the chinos and squeeze the bones and vegetables to collect all the juice. Cook gnocchi in a salty water for 5 minutes. Fry the fish lightly in a pan with cooking oil. 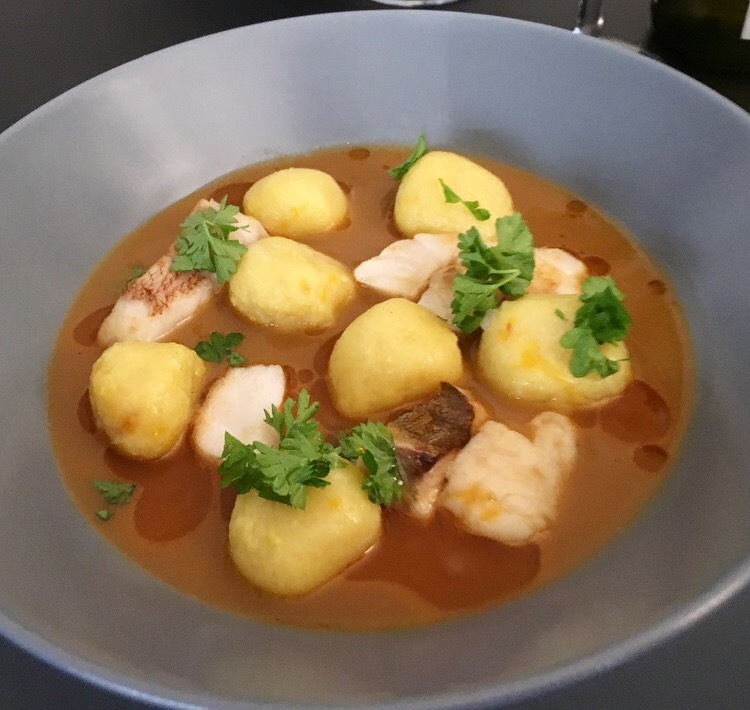 In a soup bowl pour 5 pieces of fish with 5 gnocchi and pouring with the hot soup. Garnish with fresh parsley and EV olive oil.